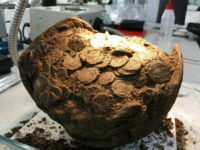 A hoard of 1,608 coins Roman coins discovered by metal detectorists in a field it Boldre, in the New Forest near Lymington, Hampshire, in 2014, has gone on public display for the first time at the St Barbe Museum and Art Gallery in Lymington. The hoard dates to the 3rd century A.D. and contains bronze radiates from the second half of the 3rd century. 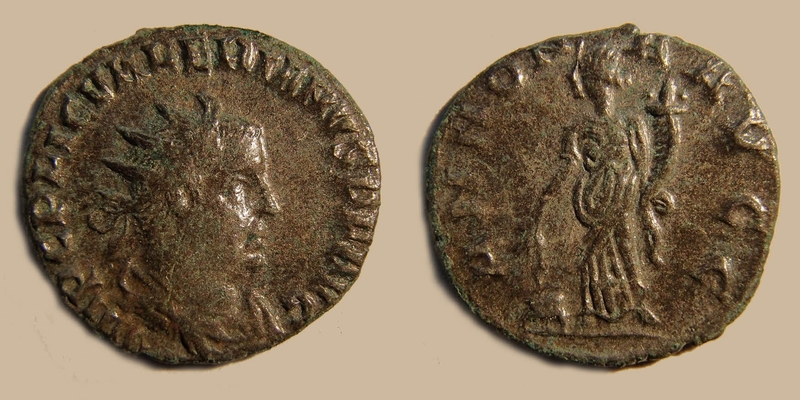 The earliest coin in the group was minted under the reign of Trebonianus Gallus (249-51 A.D.). The most recent is barely 25 years older, struck in 276 in the waning days of the emperor Tacitus (275-6 A.D.). The bulk of the coins were found in the remains of a round vessel, 15 sherds from the bottom of the earthenware pot. 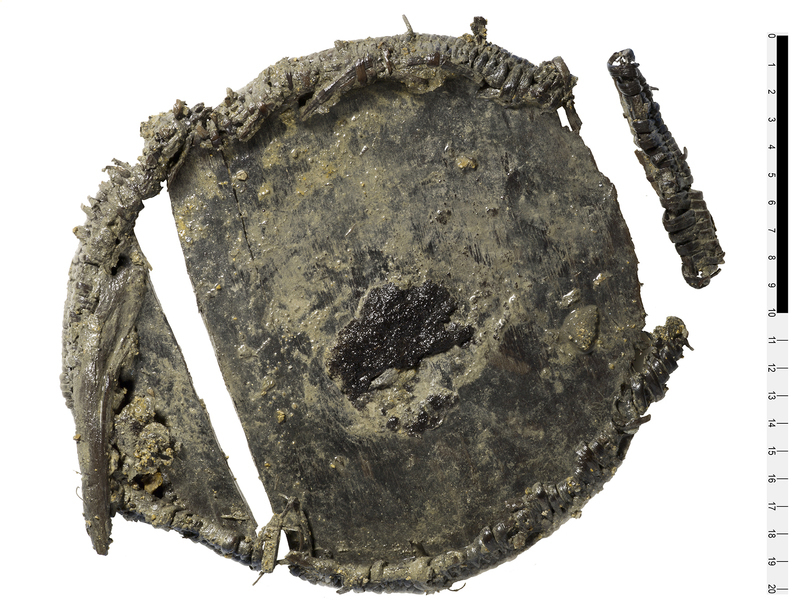 After slumbering underground for more than 1,700 years since its owner buried his savings, disturbed only by the farm equipment that likely broke the pot, the hoard has seen quite a bit of drama starting with the moment of its discovery. There were several metal detectorists scanning that field in Boldre on May 4th, 2014, among them two old friends Andy Aartsen and James Petts. Aartsen made the first discovery: 25-30 coins on their own. Then Petts hit the motherlode, finding the remains of the pot and its coin hoard of more than 1,500 pieces. Aartsen had scanned that area earlier and gotten a signal but had moved on. According to the rules of the metal detecting club, if you walk away from a signal it counts as abandonment and the next guy gets to pick up where you left off, but Aartsen apparently thought his earlier signal granted him perpetual rights because he told Petts “Eff off, it’s mine.” That’s a quote from James Petts’ testimony at the coroner’s inquest that determined whether the coin hoard was official treasure by the standards of the Treasure Act of 1996, which is downright spicy compared to the usual testimony from British Museum and Portable Antiquities Scheme experts one encounters at treasure inquests. The conflict caused a permanent rift between the former friends, and it really wasn’t about the money because bronze radiates aren’t big ticket items. The amount of the valuation that would be paid by the museum that acquired the hoard was around £8,000 to be split 50/50 by the finder and landowner. This fight was all about credit, who gets to be the official finder of the Boldre Hoard. Andy Aartsen wanted to be declared the sole finder; Petts wanted it declared a joint find of both men, which seems more than fair given that he found the vast majority of the hoard and the container. At the time of the inquest, the dispute was still ongoing and Central Hampshire Coroner Grahame Short suggested the two ex-friends might have to duke it out in court if they couldn’t come to an agreement. I couldn’t discover what the disposition their dispute was, but the articles about the new exhibition refer only to James Petts as the finder. 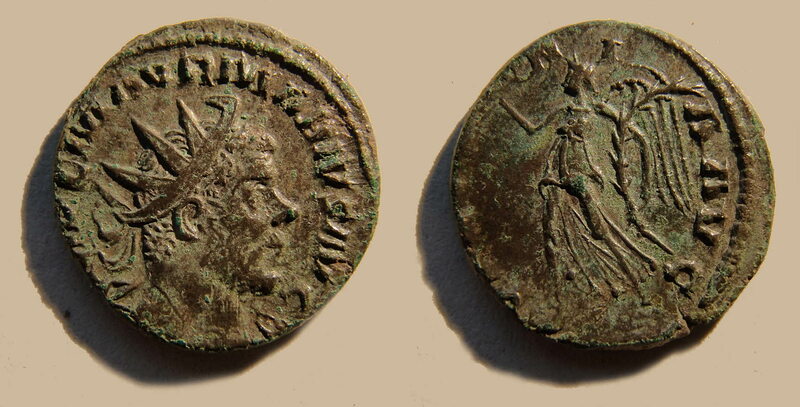 The British Museum seemed interested in acquiring the rarest of the coins — three coins struck under the rule of Marius who reigned for exactly 12 weeks in 269 A.D. — but that would have broken up the hoard. The St Barbe Museum and Art Gallery wanted to keep every coin and the pot together and put them on display a few miles away from where they were discovered and that was going to require some fast fundraising. Rosalyn Goulding, of the museum, said the coins were an “exciting” find for the town. 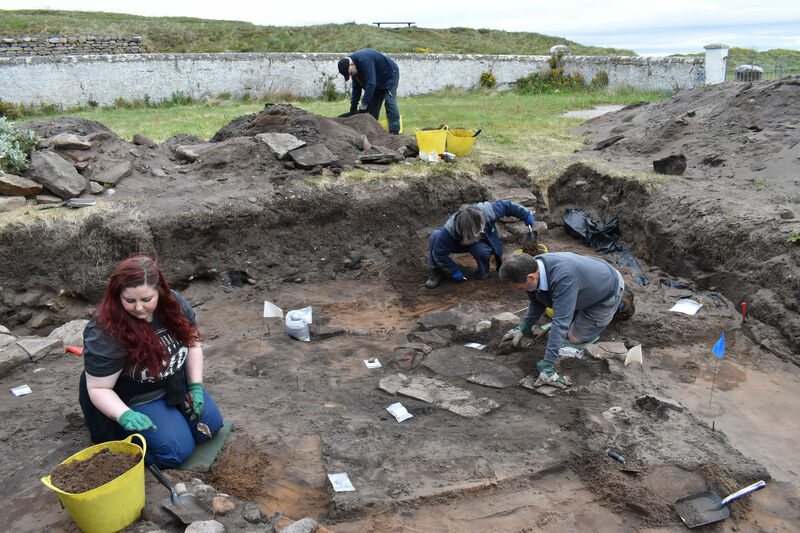 “We haven’t had too much evidence of Roman activity here but this find helps us to build up a picture of settlement and agriculture,” she said. “One of the coins is really interesting because it has an unrecorded reverse. Historian and television presenter Dan Snow who lives in the area launched the fundraising campaign last fall with a target of £30,000 ($40,000). Donations large and small came from private individuals, local businesses, organizations and grants from charitable trusts. When the January 31st deadline arrived, the campaign was just short of its target at £27,842.20. One of the donors, American Anglophile Richard Beleson, bumped up his already generous donation of £7,500 in matching funds to cover the shortfall. The refurbished museum had its grand reopening on Saturday with the Boldre Hoard as its centerpiece and signature treasure. Lord Montagu of Beaulieu did the honors, officially opening the inauguration day festivities. Medieval Coptic murals have been discovered on the walls of the Monastery of Saint Bishoy at Wadi El Natrun in the Nitrian Desert of northern Egypt. The monastery was damaged by flooding in 2015 and experts from the Ministry of Antiquities have been working since then to restore it. 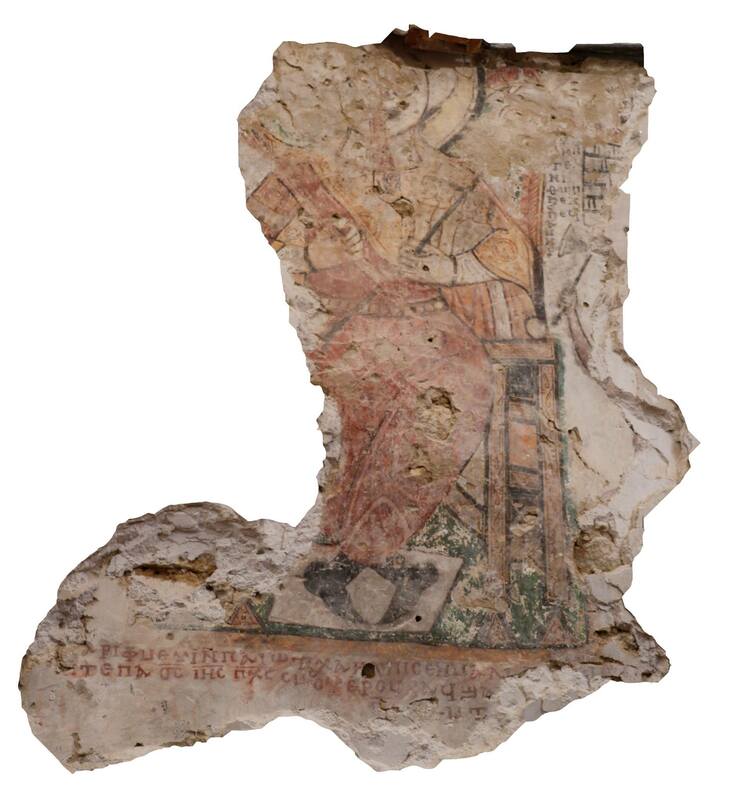 The frescoes were discovered under a layer of modern mortar. They were painted between the 9th and 13th centuries and depict saints and angels. Some of the frescoes have Coptic inscriptions underneath them. “The most distinguished paintings are those on the western and eastern walls of the church,” [Ministry of Antiquities scientist Ahmed El-Nemr] said, describing the painting on the western wall as showing a woman named as Refka and her five sons, who were martyred during the persecution of Christians by the Roman empire. 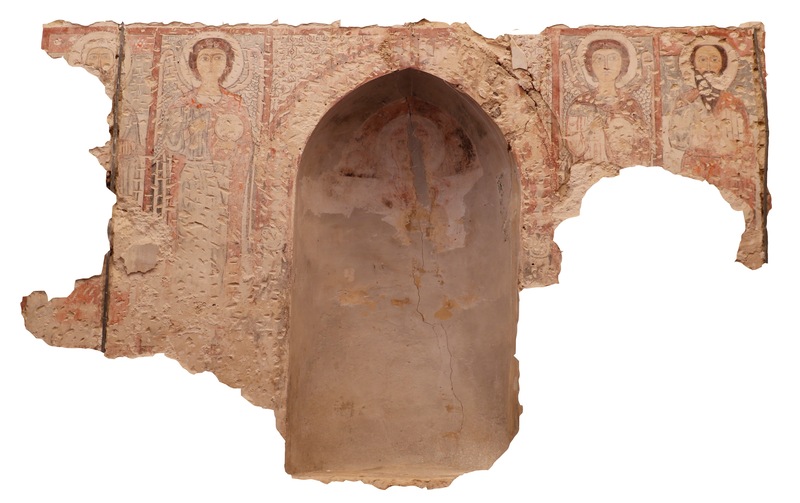 The painting on the eastern wall depicts three saints and an archangel, and features Coptic writings below. El-Nemr explained that when restorers removed the modern additions they stumbled upon the ambon, an elevated platform that is a feature of many orthodox churches. The newly discovered ambon is made of mud-brick covered with a layer of mortar and decorated with a red cross. Some geometric drawings, crosses and lettering were also found in various parts of the church. The age of the paintings, inscriptions and the ambon are of particular significance because they date to a period when the monastery church was undergoing extensive alterations. Historical and religious records document extensive changes to the architecture and decoration of Saint Bishoy’s in 840 AD, during the Abbasid era, and in 1069 AD, during the Fatimid caliphate. 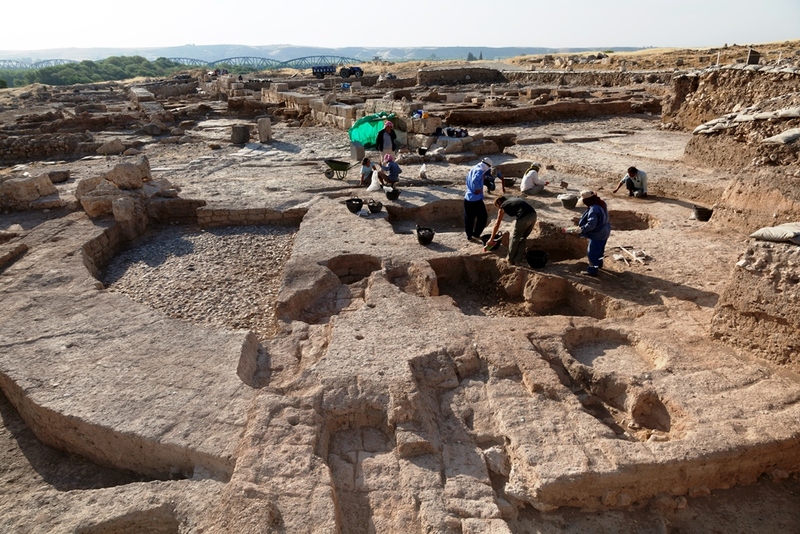 Archaeologists hope the newly discovered features may elucidate some the church’s original design and fill in some of the blanks in the timeline of its construction phases from antiquity into the modern era. The monastery was founded in the 4th century by Saint Bishoy (320 – 417 A.D.), a deeply devout monk who, like many of his time, emulated the ascetics and lived in the desert wilderness. His humility, dedication to prayer, hard work and the poor earned him a following of thousands who flocked to live in mountain caves surrounding his cave in what is now Deir el-Surian, about a third of a mile from the Monastery of Saint Bishoy. According to Coptic hagiographies, Bishoy’s humbleness netted him at least two personal meetings with the risen Christ. The first time he was washing the feet of passing strangers, as was his wont, when he spotted crucifixion scars on the feet of one of them and realized he’d just washed Jesus’ feet. Another time he offered to carry an old ailing monk up the mountain on his back only to find the ailing old man was Jesus in disguise (again). Jesus told him then that because he had kept his body pure through his asceticism and used it only to serve the poor, lowly and God, including carrying God on its back up a mountain, Bishoy’s body would never decay. Jesus kept his promise. When Bishoy’s body was moved to the Wadi El Natrun monastery in 841 A.D. by order of Saint Joseph I of Alexandria, 52nd Pope of Alexandria, it was indeed found to be incorrupt. The saint’s body lies in the monastery church to this day, and according to witnesses is still incorrupt. 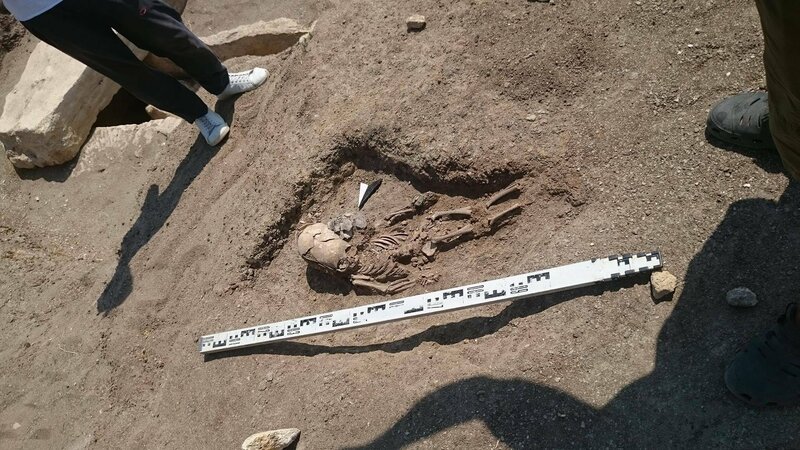 Archaeologists and student volunteers have discovered the skeletal remains of a young child with an artificially deformed cranium in a necropolis on the Kerch peninsula in eastern Crimea. 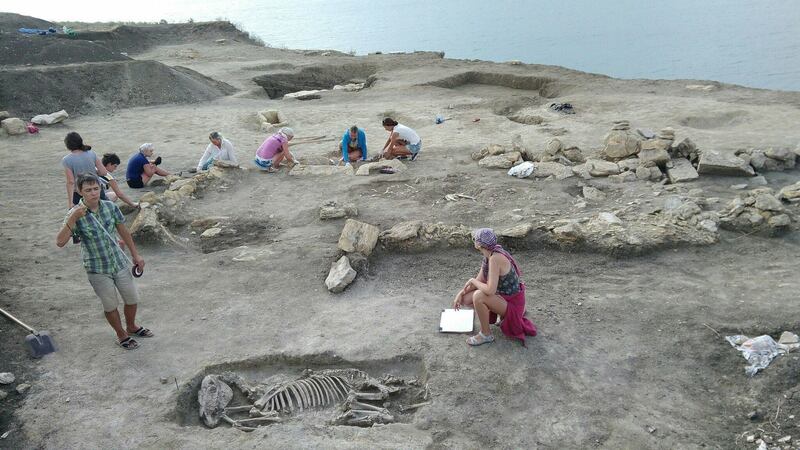 The team from the Institute of Archeology of the Russian Academy of Sciences and the Archeology Foundation have been excavating the ancient necropolis of Kyz-Aul for three weeks. Several graves dating from the 1st century B.C. to the 3rd century A.D. have already been unearthed during this field season. They’ve found the remains of Sarmatian soldiers in monumental stone crypts and horse burials, but the child’s grave is the only one to feature the elongated skull characteristic of intentional cranial deformation. Researchers have confirmed from osteological analysis that the remains are those of a boy. Because his fontanelle was not fully closed, scientists were able to determine that he was around 18 months old at time of death. His remains were radiocarbon dated to the 2nd century A.D. when the peninsula was part of the Bosporan Kingdom, a Hellenistic kingdom that became a client state of the Roman Empire in 1st century. The bones are in an excellent state of preservation. Buried with the child were a clay vessel near his head and a few small beads of colored glass. The boy was wearing a copper alloy bracelet on his right wrist. He was interred directly in the ground. No remains of a coffin, gravestone or marker were found. The excavation team nicknamed this find “the grave of an alien” because of the skull shape, an unfortunate phrase that all of the articles in the press have glommed onto even though intentional cranial deformation has been an entirely terrestrial human phenomenon for thousands of years. Examples of it have been found in every inhabited continent, and the inhabitants of the Black Sea coast, most notably the Sarmatians, had been altering their children’s’ skull shapes for centuries by the time this little boy was born. The cranial modification process began in infancy when the bones of the skull are malleable. In the Black Sea region, people wrapped plaits around babies’ heads and over time the pressure of the wrapping changed the shape of the skull. The elongated egg shape was considered more aesthetically pleasing than the regular old boring skulls they were born with, and had important cultural and social significance because it was an attribute of the Sarmatian military nobility who were increasingly powerful in the Bosporan Kingdom. It was primarily boys destined to be elite fighters who had their skulls modified, so it’s likely this child was slated to be a Sarmatian warrior. The date of the child burial is a meaningful one within this context because the Sarmatian warrior elite, who mainly fought as heavy cavalry for the Bosporan Kingdom, had grown in power and influence to such a degree that by the 2nd century A.D., the formerly Hellenistic kingdom was increasingly Sarmatized. It was in the 2nd century that the last of the Greek ruling dynasties died out and was replaced by a new Sarmatian dynasty. This takeover had far-reaching cultural implications. Artisan crafts were decorated with Sarmatian motifs instead of Greek ones. Even the way people dressed changed, with trousers and long-sleeved shirts replacing the Greek tunics and gowns. At the same time, Sarmatians made peace with the Romans, who had been fighting them since the 1st century B.C., and in 175 A.D. negotiated a treaty with Emperor Marcus Aurelius. By the terms of the treaty, the Sarmatians agreed to send Rome 8,000 of their famed heavy cavalry. More than half of them were sent very far from home to guard Hadrian’s Wall. Sarmatian artifacts — weapons, beads — have been found at the wall, and there are surviving documents that record Sarmatian squadrons manning several of the forts. 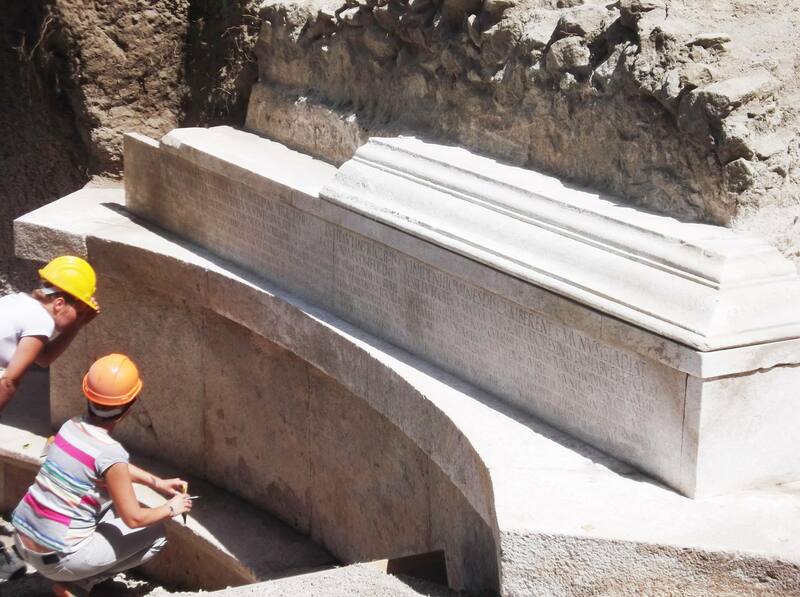 Archaeologists working near Pompeii’s Porta Stabia gate have unearthed a monumental tomb with the longest funerary inscription ever discovered in the ancient city. The tomb was found by accident during maintenance and restoration work on buildings in the San Paolino area as part of the EU-funded Great Pompeii Project. A crew restoring a 19th century palazzo slated to become the new library and offices of the archaeological superintendency came across a fragment of marble while doing depth tests on the foundations. Marble is very rarely used in Pompeiian funerary monuments, so archaeologists realized immediately that this could be something special. Because a new excavation was outside the parameters of the EU funding, they had to scrounge up 200,000 euros from the regular budget to dig the find site in anticipation of discovering something of significance. They were not disappointed. The top of the tomb was lost, likely destroyed during the construction of the palazzo in hte 19th century, but what remains is a large and imposing marble structure that is unique among Pompeiian funerary monuments. The inscription carved into the marble facade is more than four meters (13 feet) long and has seven lines eulogizing the deceased’s life and successes. He was grand even as a teenager, we are assured, when he hosted a great banquet to celerate his donning of the toga virilis (“toga of manhood”) when he was 15-17 years old. He set up no fewer than 456 triclinia (formal dining rooms) to accomodate thousands of members of the public. Not content with merely feeding everyone, he treated them to games fielding 416 gladiators. We know from inscriptions and contemporary sources that no more than 30 pairs of gladiators fought in the regular games in Pompeii, so this figure is miles out of the ordinary, the kind of spectacle you’d see in Rome, not in a modest southern Italian colony. Largess is a recurring theme in the res gestae of this prominet citizen. Other subjects covered in the inscription are his wedding and its extra fancy banquet, the political and religious offices he held, the many gladiatorial games and venationes (beast hunts) he sponsored, his generous gifts of silver coin to the people and moneys in support of magistrates and guilds. He was one of the duoviri quinquennales (the two heads of the city administration elected every five years with additional powers to update the census) and was acclaimed by the people as patronus of the city, which he humbly declines in the last line of the inscription because he is unworthy of so great an hour. Director General of the Pompeii archaeological site Massimo Osanna calls it the most important find of the last few decades, and one of the most important in the history of the site. He’s all but certain of the identity of the tomb’s occupant. The details in the biographical inscription, the luxuriousness of the monument and its location near the tombs of the Alleius family strongly suggest this was the final resting place of Gnaeus Alleius Nigidius Maius, duoviri quinquennales for 55-56 A.D. and an immensely rich and well-connected games impresario. 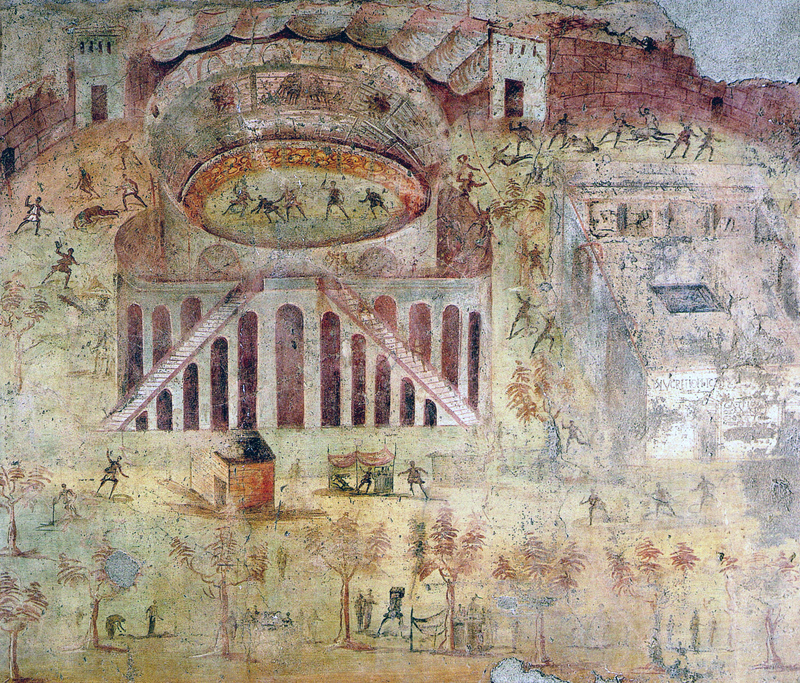 No Pompeiian is better documented in the archaeological record. His name appears in 17 inscriptions, graffiti and edicts painted on the walls on the city. 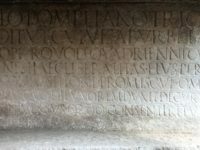 One of the edicts painted on the facade of the house of A. Trebus Valens on the Via dell’Abbondanza advertises Maius’ latest gift to the people: “Twenty pairs of gladiators and their substitutes of the quinquennialis Gnaeus Alleius Nigidius Maius will fight at Pompeii. No public monies will be used.” Illustrating that any excuse will do to throw a party, another edict on the Via dell’Abbondanza announces: “For the inauguration of the paintings on wood of Gnaeus Alleius Nigidius Maius, on June 13th, there will be a parade, a hunt of wild beasts, fighters, and the velarium.” Maius died a year before the cataclysmic eruption of Vesuvius that buried Pompeii in 79 A.D. He was very much a new man, a symbol of a society that was becoming increasingly mobile under the emperors of the 1st century. His father was a freedman who had made a fortune and had no bones about spending it on massively oversized celebrations to get his son started on a political career that would be largely based on throwing the biggest and best games in town. His humble beginnings were no deterrent to Maius’ ascent. He was a personal friend to the emperor Nero, and indeed, may have been involved in the resolution of one of Pompeii’s most explosive events before the literally explosive event that stopped the city in its tracks. In 59 A.D., there was a giant and deadly brawl in the amphitheater between the local Pompeiians and the residents of nearby Nuceria, which had been a rival since Sulla’s conquest of Pompeii in 80 B.C. Old resentments were stirred up afresh when Nero gave some Pompeiian territories to Nuceria two years before the fight at the amphitheater. This likely played a part in things coming to blows that day, although it’s unknown exactly what sparked the conflict. About the same time a trifling beginning led to frightful bloodshed between the inhabitants of Nuceria and Pompeii, at a gladiatorial show exhibited by Livineius Regulus, who had been, as I have related, expelled from the Senate. With the unruly spirit of townsfolk, they began with abusive language of each other; then they took up stones and at last weapons, the advantage resting with the populace of Pompeii, where the show was being exhibited. And so there were brought to Rome a number of the people of Nuceria, with their bodies mutilated by wounds, and many lamented the deaths of children or of parents. The emperor entrusted the trial of the case to the Senate, and the Senate to the consuls, and then again the matter being referred back to the Senators, the inhabitants of Pompeii were forbidden to have any such public gathering for ten years, and all associations they had formed in defiance of the laws were dissolved. Livineius and the others who had excited the disturbance, were punished with exile. 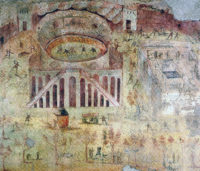 Before now, the Tacitus passage, a fresco in the house of Actius Anicetus and three graffiti found on walls at Pompeii were the only explicit references to the amphitheater riot of 59. The funerary inscription adds a key piece of information about this event. Thanks to the deceased’s personal relationship with Nero, he was able to persuade him to allow the two duoviri exiled as punishment for the brawl to return to Pompeii. This is the only reference to the duoviri having been exiled as well as the only reference to the intercessionary role Maius played. It opens up the possibility that he was involved in the softening and lifting of the 10-year ban on public events at the amphitheater. It’s known that some combat spectacles like animal hunts took place during the first three years of the ban, and it was lifted entirely in 62 A.D. to celebrate the restoration of the amphitheater after an earthquake. There is no name recorded in the inscription. 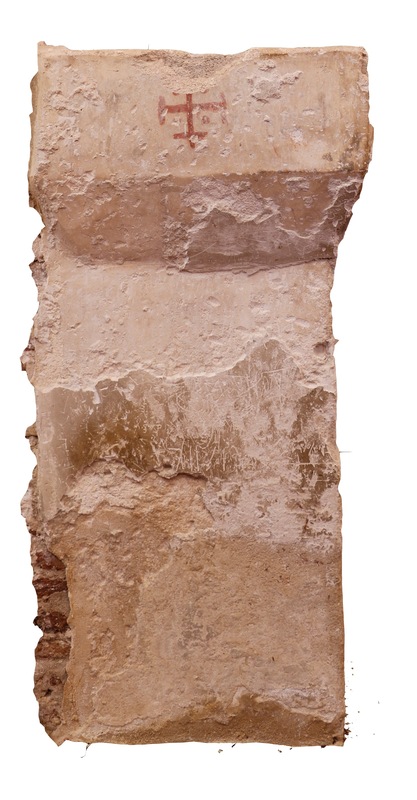 It was probably in a larger font on a higher panel on the tomb facade which is now lost. Archaeologists are still excavating so it’s possible we’ll receive absolute confirmation of whether this is in fact the tomb of Gnaeus Alleius Nigidius Maius. 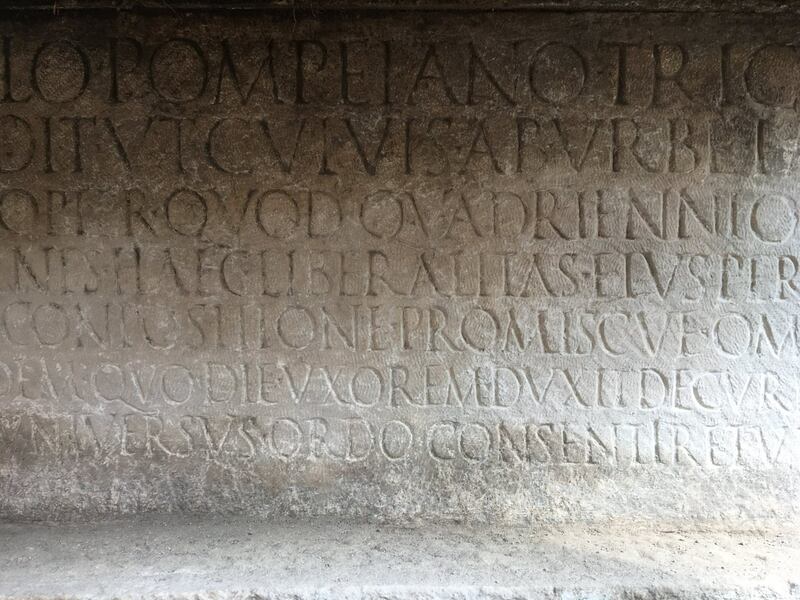 Meanwhile, the res gestae inscription on the tomb, the first of its kind ever found in Pompeii, make it as close to a sure thing as we can get. 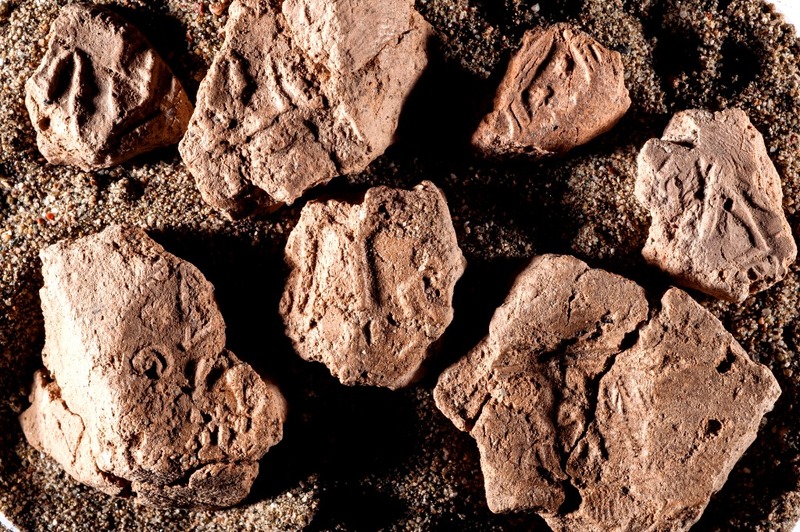 Another first of its kind discovery was made at this remarkable site. 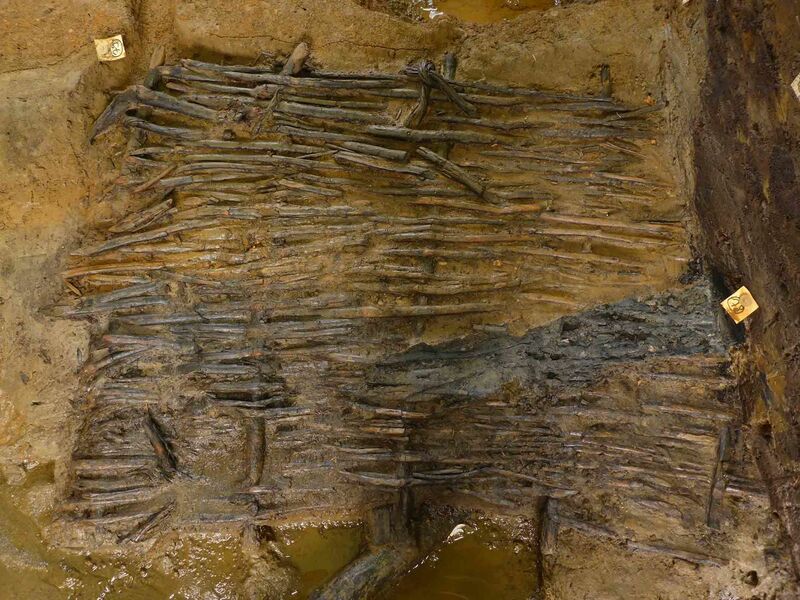 Just in front of the tomb are two cart ruts embedded in a layer of stone debris two meters (6.5 feet) thick. The debris is from the rockfall phase of the eruption, and tracks were left by people fleeing the city. 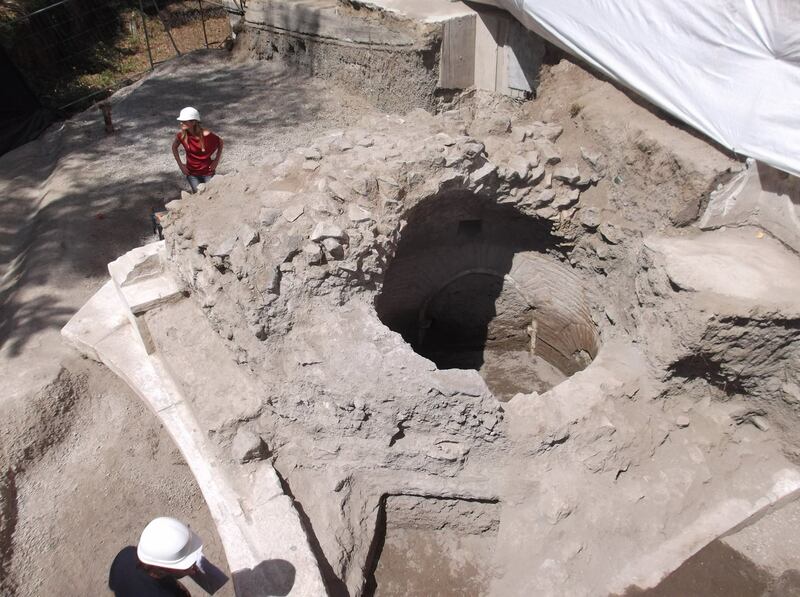 These are the first archaeological remains of Pompeiians mid-flight ever found. 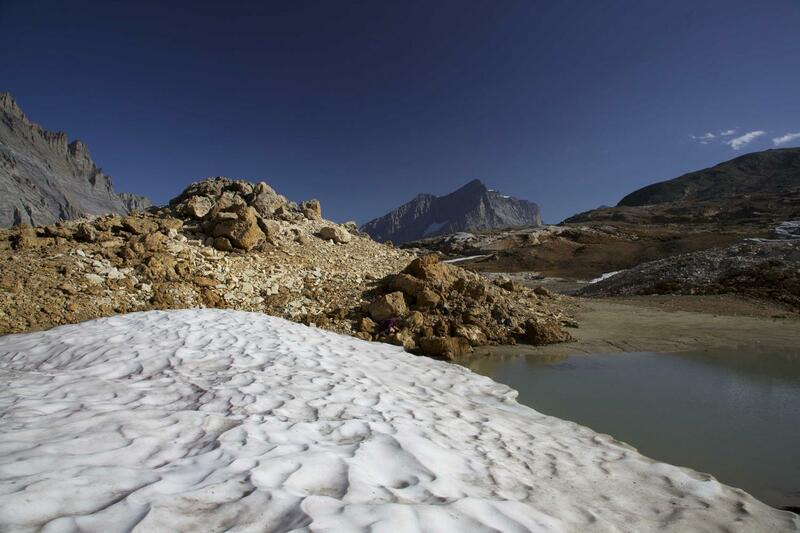 In 2012, a wooden box was exposed by melting glacier ice of the Lötschenpass, 2650 meters above sea level in the Bernese Alps. Round and about eight inches in diameter, the unusual box was made of three different kinds of wood: pine for the floor, willow for the curved side and spliced larch boughs for the seams joining floor to side. 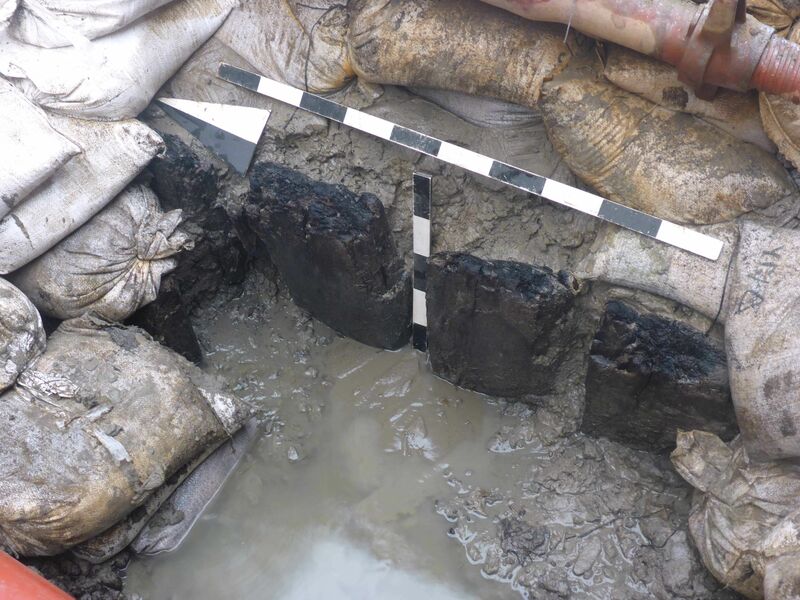 Radiocarbon testing found the box dates to the early Bronze Age, about 4,000 years ago. 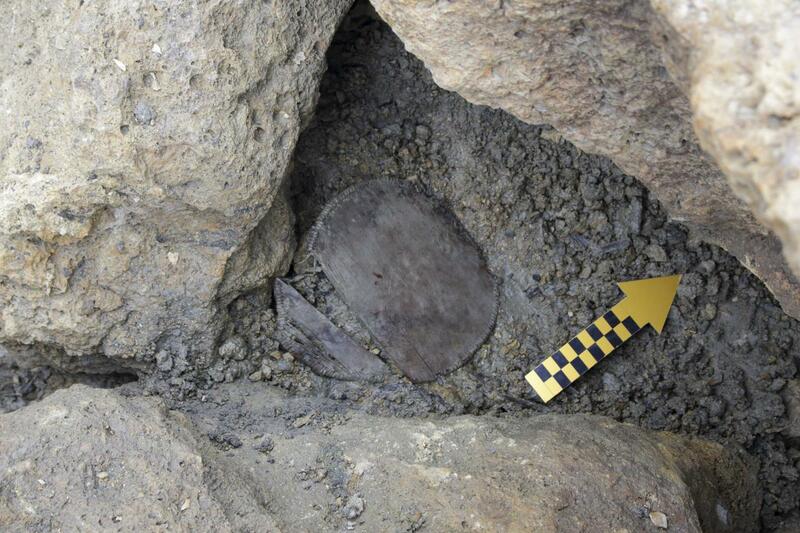 The ice that preserved the wooden box for four millennia also preserved traces of its contents. An international team of researchers analyzed the residue expecting to find milk remnants, perhaps all that was left of a porridge type food. Samples of the residue were subjected to lipid and protein analysis. 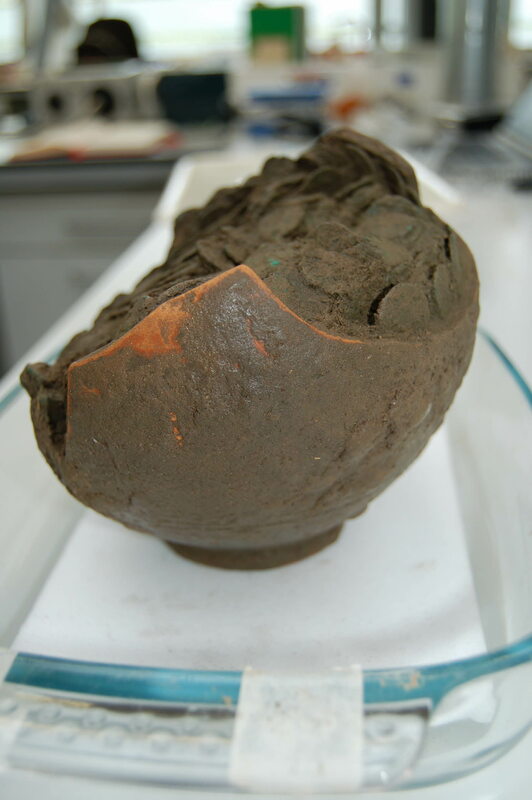 Researchers examined the samples using microscopic and molecular analysis to identify any lipids and gas chromatography mass spectrometry for the proteins, a combination of techniques commonly used to identify residue in ancient and prehistoric ceramic vessels which survive in far greater numbers than wooden ones. The results were surprising. Instead of milk remnants, the team found alkylresorcinols, indicators of the presence of whole grains. If phenolic lipids can be identified in ceramic vessels as well, it opens up the possibility of tracing the use and spread of cereals at the dawn of agriculture, information that is currently non-existent. Researchers can’t tell at this point how the wheat cultivars made their way into the Swiss Alps. Some of the valleys in the area are known to have been inhabited during the Bronze Age, and grave goods have been discovered in burials in the neighboring canton of Valais that were imports from north and south of the mountains. The Lötschenpass may have been part of a trade route linking the Bernese Highlands to the Valais. Or it may not have anything to do with trade, just a box lunch packed by a lone hiker on a hunt or a drover pasturing cattle at higher altitudes than archaeologists realized were being used for grazing during this period. The study on the identification of cereals in the Bronze Age box has been published in Scientific Reports and can be read here. In the Middle Ages, old manuscripts were recycled for their valuable vellum and parchment pages. The writing was washed or scrubbed off and the leaves filling with new content. 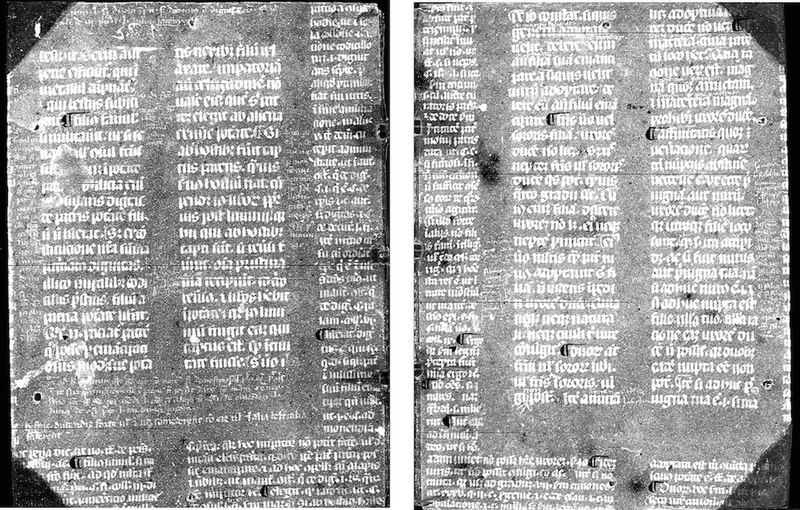 Because so many ancient works have been lost, scholars have for centuries attempted to recover the original texts from these medieval palimpsests, often using caustic materials that damaged the pages in the long term. Nowadays researchers have much better options thanks largely to a panoply of imaging technologies that have been a godsend to the study of palimpsests, revealing erased and overwritten text that cannot be seen with the naked eye. Synchrotron imaging is better than Superman because it can see through lead boxes. Some of the recycled parchments pose greater challenges than others. With the introduction of the printing press to Europe in the 15th century, the demand for bookmaking materials soared. Not only were medieval manuscripts cannibalized for their pages, but the bindings were reused to bind newly printed books. This was a common practice well into the 18th century, so there are a lot of old printed books out there with fragments of medieval and ancient texts hidden in the binding. Scholars knew there might be literary treasures in there, but were stumped by the difficulty of accessing and reading binding materials. Now researchers at Northwestern University have made a breakthrough. It was a book from the university library’s collection that inspired the new approach. It’s an edition of the Works and Days by the Greek poet Hesiod that was printed in Venice in 1537. Northwestern acquired it in 1870 and out of the 30 known surviving copies of the edition, this is the only one that still has its original slotted parchment binding, a widely used technique in Venice from 1490 to 1670 in which slots were cut into the binding parchment to match the shape of the book spine. Slotted parchment bindings often used recycled parchments. The ink was usually removed for aesthetic purposes, to make the outside surface of the parchment a uniform color. 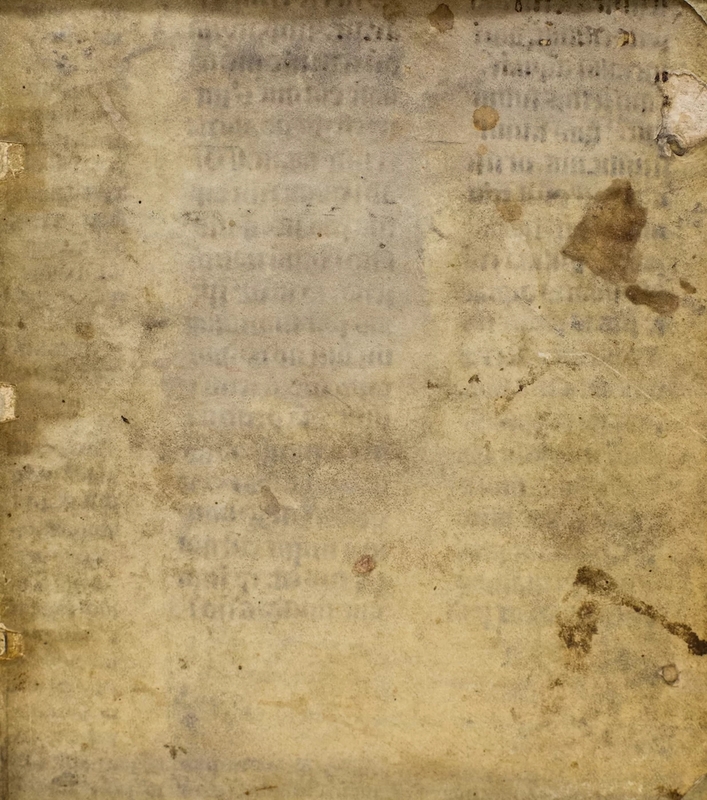 In this particular book, the ink on the interior parchment surface was not removed. Iron gall ink is acidic and over time, speeds up the oxidation and decay of the parchment. The Northwestern librarians noticed the slotted parchment binding in the Hesiod and realized its significance. They also saw the faintest hint of text on the book board. Researchers from the Northwestern University-Art Institute of Chicago Center for Scientific Studies (NU-ACCESS) examined the binding in greater detail and found evidence that the writing on the book board had been removed, likely by the bookbinder, by washing or scraping. His efforts weren’t entirely effective, much to our advantage. Over time the gall ink that wasn’t removed had degraded the parchment and the writing began to re-emerge. NU-ACCESS researchers found two columns of text plus marginalia were very dimly visible through the parchment on the front and back covers of the book. The writing wasn’t legible with the naked eye, so scientists Marc Walton and Emeline Pouyet turned to imaging, starting with visible light hyperspectral imaging. The writing became a little clearer, but it still couldn’t be read. X-ray fluorescence imaging gave the team new information about the chemical composition of the ink, but again, it wasn’t able to bring the ancient text out of hiding. They were going to need a bigger boat, to paraphrase Jaws, and the Cornell High Energy Synchrotron Source (CHESS) was that boat. [T]he bright x-ray source and fast detection system allowed for a full imaging of the main text and marginalia comments in the entire bookbinding. When the researchers sent the more clearly imaged writing to [Northwestern history and religion professor Richard] Kieckhefer, he immediately recognized it as sixth-century Roman Law code [the Institutes Justinian], with interpretive notes referring to the Canon Law written in the margins. 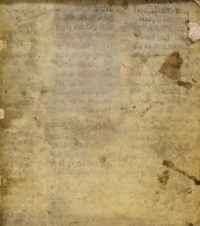 Walton and Pouyet hypothesize that the parchment originally might have been used in a university setting where Roman Law was studied as a basis for understanding Canon Law, which was a common practice in the Middle Ages. The legal writing was then possibly covered and recycled because it was outdated as society had already struck down the Roman laws to implement church code. It was an exciting find, but the NU-ACCESS team had greater ambitions. Synchrotrons aren’t exactly a dime a dozen, and most researchers don’t have access to the powerful (and expensive) equipment. Even if they do, rare old books in delicate condition can’t always be shipped to a synchrotron facility. For conservation reasons, they often can’t be shipped anywhere at all. 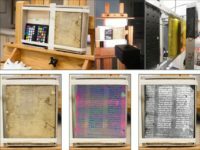 Walton and Pouyet turned to Northwestern’s computer scientists to seek a cheaper, more readily available technology that would be able to read challenging palimpsest texts trapped in bookbindings. Using a machine-learning algorithm developed by his team, Katsaggelos discovered that not one imaging technique but a fusion of two would yield the best results. His team combined visible hyperspectral imaging, which includes wavelengths within the visible light spectrum to provide high spatial resolution, with x-ray fluorescence imaging, which provides high intensity resolution. The algorithm informed the researchers of the relative contribution of each modality to produce the best image. Katsaggelos’ data fusion image was so clear that it rivaled an image of the main text produced by the powerful x-ray beams at CHESS. Walton and Pouyet plan to take this show on the road. They want to examine books in museums and other institutions using the combination of hyperspectral imaging and x-ray fluorescence to read hidden texts on pages and bindings. You can read the team’s publication of their results in the journal Analytica Chimica Acta here. The Fossa Carolina (Karlsgraben in modern German) is named after Charlemagne, King of the Franks, future Emperor of the Romans, who according to contemporary Carolingian sources commissioned its construction in 793. About two kilometers (1.2 miles) long, the canal was meant to link the Swabian Rezat river in Treuchtlingen to the Altmühl river in Weissenburg, Bavaria. The Rezat is in the Rhine basin and the Altmühl is a tributary of the Danube, so the ultimate idea behind the canal was creating a navigable water route that would allow easy boat travel between the Rhine and the Danube. Whether it was a practicable solution in real life was a whole other ball of wax. According to the Revised Royal Frankish Annals, Charlemagne was “persuaded by self-styled experts that one could travel most conveniently from the Danube into the Rhine if a navigable canal was built between the rivers Rezat and Altmühl.” Reliable canal-linked fluvial transport was immensely important to Charlemagne in 793. He had been forced to end his 791 campaign against the Avars south of the Danube when his cavalry was stricken by the Eastern equine encephalitis (EEE) virus. The deadly mosquito-borne illness killed 90% of Charlemagne’s horses and other equines — war steeds, travel mounts, pack animals — in a matter of days. The few equines that survived a bout of EEE would have been severely disabled, suffering from brain damage and neurological symptoms that made it impossible for them to perform their usual duties of combat and transportation. This was a logistical headache of brain-shattering proportions. Without horses and mules, the army’s supplies, weapons, armour and assorted gear had to be carried by people, at least some of it by horseless cavalrymen, to the Danube where it was loaded on boats. Charlemagne’s forces were so hobbled by the mass death of its equines that he wasn’t able to go on campaign for two years, and Charlemagne fought every year of his kingship, missing only four in total. If the canal worked as planned, fluvial transportation — faster, cheaper and not subject to epidemics — would make it possible for Charlemagne to get back to his military campaigns against the Avars and rebellious Saxons, a war on two fronts that would have been enormously facilitated by a canal linking the Rhine and Danube. He would have been able to use large boats, not pack animals, to move equipment and supplies down the Danube in a new campaign against the Avars the next year. In addition, the actual digging of the canal required few horses, a big plus in a time of such equine scarcity. It was such an important project that Charlemagne took up residence in Weissenburg in the fall of 793 to oversee construction of the canal. He personally saw to the hiring of a large team of builders. Under his direct supervision, the crew dug a moat 2,000 feet long and 300 feet wide. Again according to the Annals, canal constructed ended abortively, defeated by the marshy ground and constant rainfall which caused “what the workmen dug during the day, fell back in at night.” Other chroniclers claim the canal was in fact completed. Either way, Charlemagne’s attention was diverted to more pressing matters: fresh revolts in Saxony and attacks on Narbonne and Carcassonne by Umayyad Emir Hisham I of Córdoba. Today there is little left of the most important infrastructure projects of the Middle Ages. 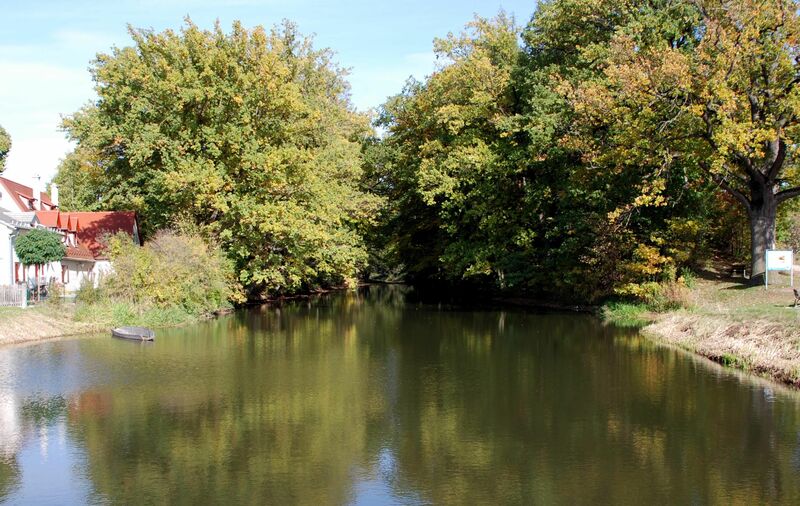 There’s a water-filled moat about 350 meters (1148 feet) long in Treuchtlingen. Earthen embankments almost 4,000 feet long and more than 30 feet high also survive, created by the soil dug out of ground during the early construction of the canal. Over the past five years or so, archaeologists have discovered the northernmost section of the structure which is not visible above ground. That section, which was fortunate enough to be forgotten and/or ignored for 1,200 years, has proven archaeologically invaluable. A team of researchers from German universities and the Bavarian State Office for the Protection of Monuments have discovered that the canal is older than the Royal Annals recorded. The question of when construction of the Fossa Carolina began has been a fraught one among historians for a century. The Alemannic Annals claim that canal construction began in 792, which would mean that Charlemagne’s stay in Weissenburg was a visit to an ongoing building site, not a new one he was personally supervising. 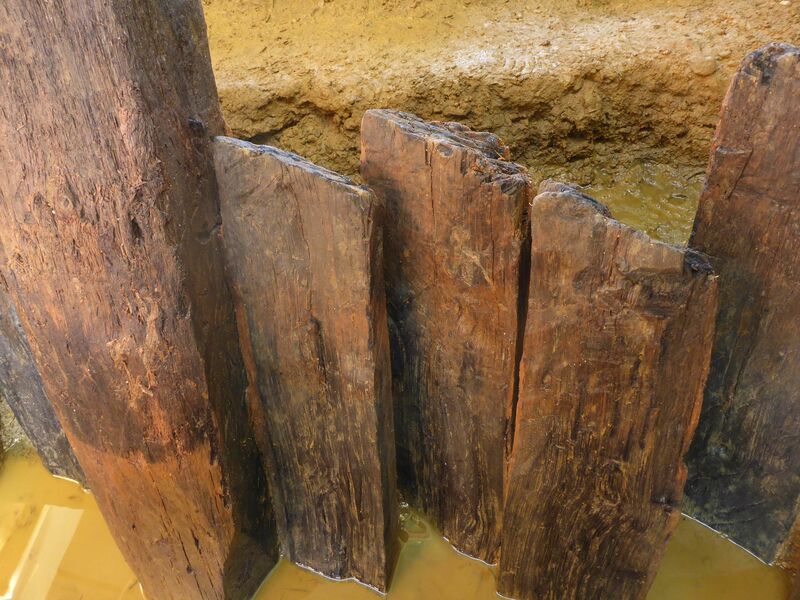 In 2013, timber pilings were discovered in the northernmost section that were dendrochronologically dated to the late summer or early fall of 793. A follow-up excavation in 2016 went even further, digging two trenches across two of the northern canal sections. 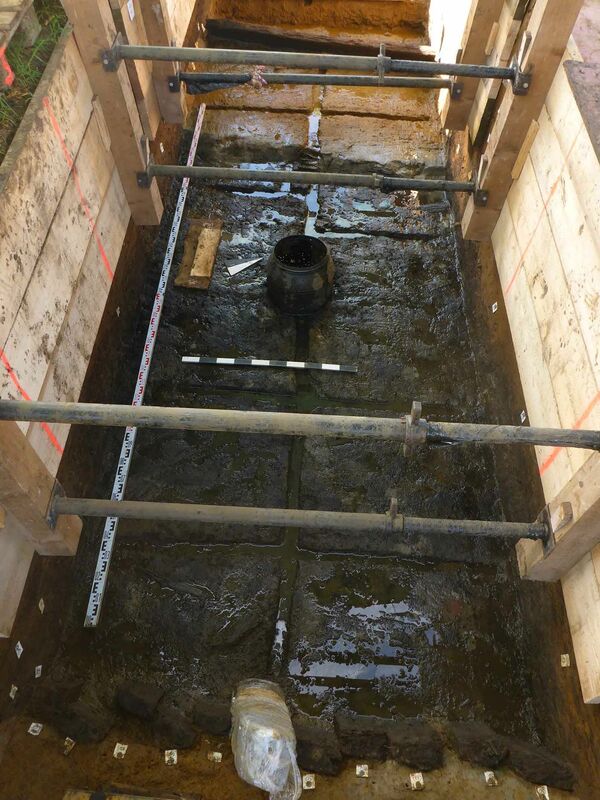 The team unearthed numerous structural elements, including large oak pilings lining the canal walls that were in an excellent state of preservation thanks to the high groundwater level and a deposit of sediments immediately after construction. The team was able to date more than two dozen timbers using dendrochronological analysis, an incredible bounty for high precision absolute dating. Tree ring analysis can pinpoint dates down to the year, sometimes even the month, and the youngest of the canal timbers tested date to the late spring or early summer (probably May) of 793. This was freshly cut wood. It hadn’t been stored for a few months before use in the canal. In the coming months, the new dates will be analyzed in detail and combined with numerous other results from the interdisciplinary research group. Due to the precise and different dates the researchers expect for the first time indications for the construction direction of individual channel sections and organizational details of the large construction site. New results are also to be expected regarding the completion or non-completion of individual construction sections. Three years ago, St. Paul’s Cathedral in London restored and displayed a hand-made altar frontal that had been by intricately embroidered by 133 convalescing soldiers during World War I. Sewing was considered a highly effective form of occupational therapy for soldiers because it could be accomplished while seated, improved manual dexterity and mental focus. The notion of occupational therapy was birthed in the crucible of World War I which left so many men physically and psychologically disabled, but it was a new name for an old practice. 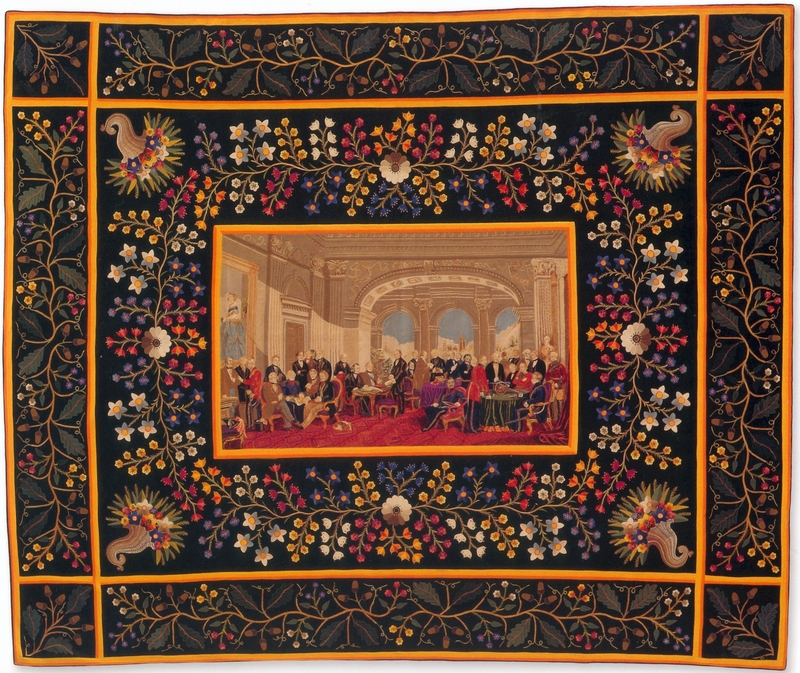 Soldiers and sailors have been stitching masterpieces of the sewing crafts for hundreds of years. It was a longstanding tradition that during lulls in fighting, while prisoners of war or over extended hospital visits, they would hand-stitch quilts, wool work seascapes and embroider their own uniforms. Sailors maintained ships’ sails as part of their duties and therefore had basic sewing skills. Soldiers didn’t have the same job requirement, so if they knew how to sew it was either fortuitous or professional; i.e., they had been tailors in civilian life and were often employed as regimental tailors in the military. 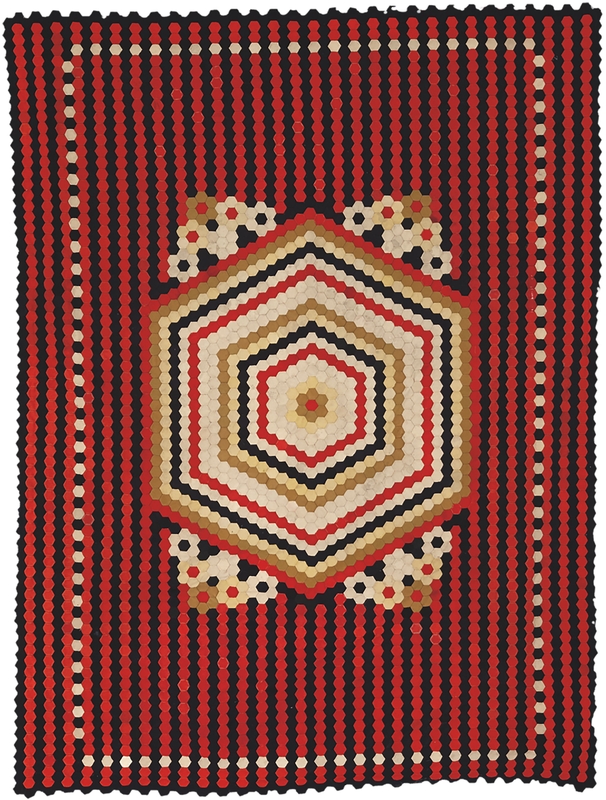 Some of the earliest surviving examples were made in the 18th century using the intarsia technique in which fabric pieces are cut in precise shapes and sewn together so that no seams show. These types of quilts are so difficult to produce that it’s likely they were created by professionals. The imagery is often related to the wars being fought and national identity — comrades, the fatherland, traditional folk tales, etc. 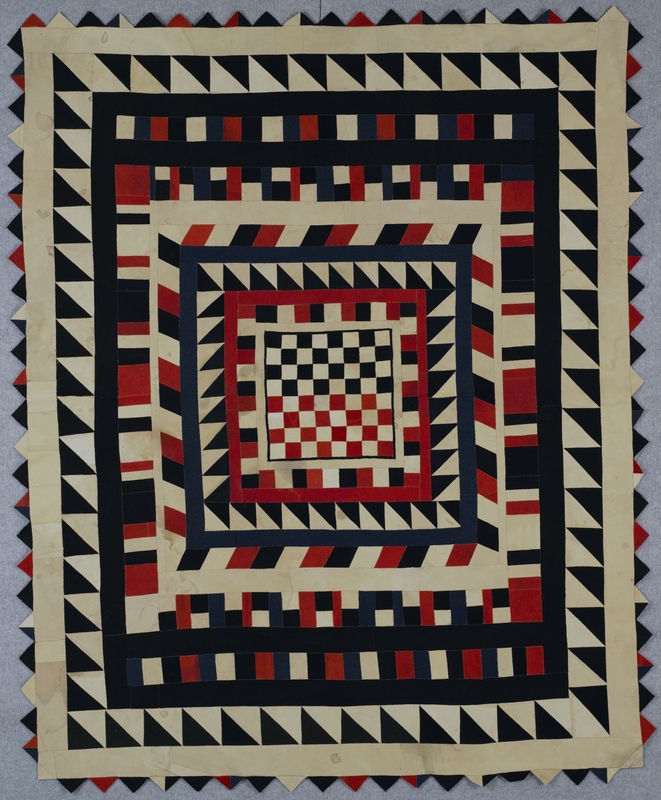 The quilts produced in wartime by military men of all levels of stitchcraft experience often used uniform pieces, blankets and random snippets of whatever other textiles they could get their hands on to create geometric designs of dazzling intricacy. 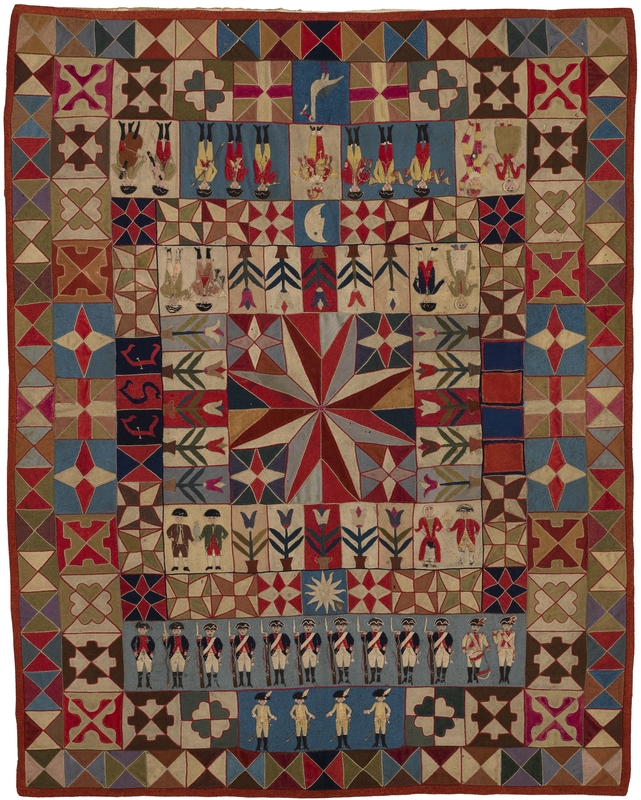 The American Folk Art Museum in New York is putting on the first US exhibition of quilts made by fighting men in wartime from uniform fabric. 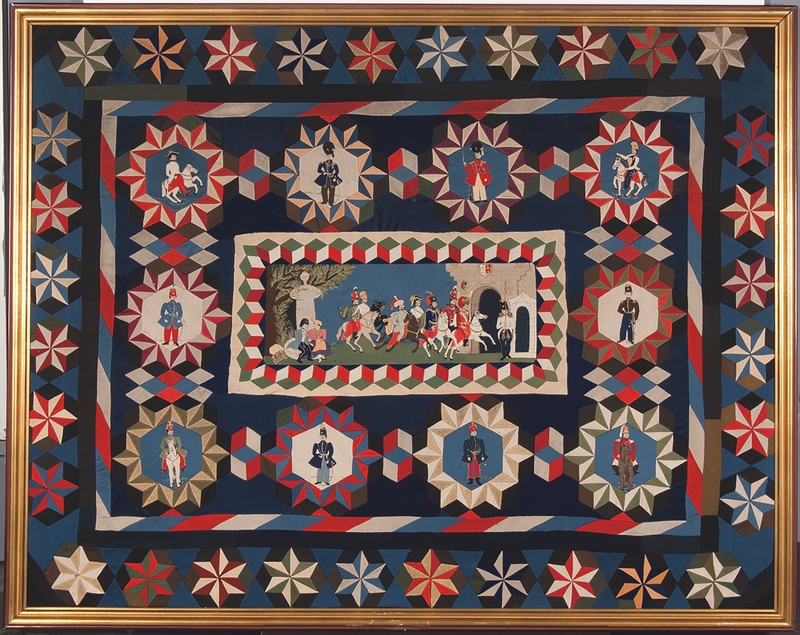 Most of the quilts on view in the War and Pieced exhibition come from the private collection of Australian quilt expert, historian Dr. Annette Gero. Others are on loan from public and private collections. Many of them have never been publically displayed before. War and Pieced will run at the American Folk Art Museum from September 6th, 2017, through January 7th, 2018. Next year the exhibition will travel to the International Quilt Study Center & Museum at the University of Lincoln-Nebraska where it will run from the May 25th through September 16th, 2018. But enough of my yakking. This post is all about the cornucopia of quiltly goodness and there’s so much more bounty to enjoy I had to put it after the jump to keep load times from going insane. A team of Turkish and Italian archaeologists have discovered what may be the first known smiley face in the ancient city of Karkemish in Turkey’s southeastern province of Gaziantep near the border with Syria. The terminally cheery curved line topped by two dots was painted on the side of pitcher around 3,700 years ago. The unusual pitcher in question was originally off-white in colour and features a short thin neck, wide body and small handle. Found in a burial chamber, it was used for a sweet sherbet-like drink, and dates back to 1,700 BC. 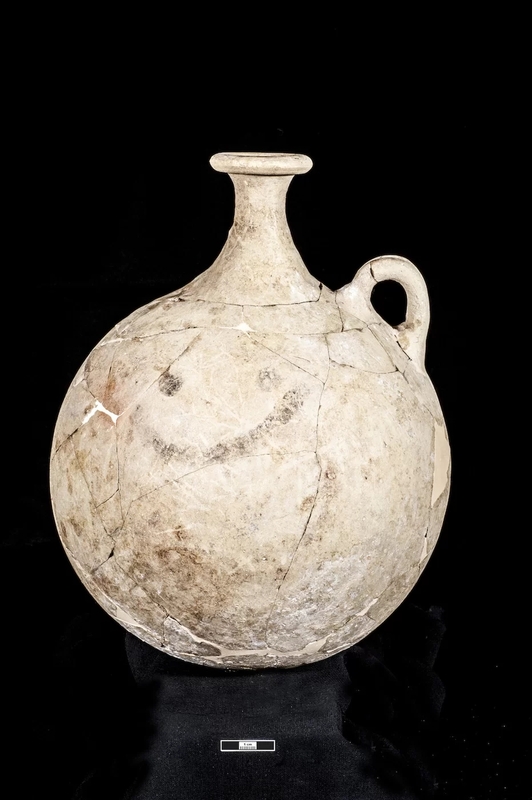 Archaeologists only realised the smile was there when the pot was taken to a lab for restoration work, Turkish news agency Anadolou reported. Occupied from the 6th millennium B.C. until it was abandoned in the late Middle Ages, the remains of Karkemish were first discovered and excavated in the late 19th century. Some illustrious figures — T.E. Lawrence, Leonard Woolley, Gertrude Bell — participated in later digs before and after World I. Even with this long history of archaeological exploration, the site still had much to reveal. The joint Turkey and Italian team has been excavating Karkemish every year since 2011. The smiley pitcher was found this season, which began on May 2nd, and it was not the only important discovery. 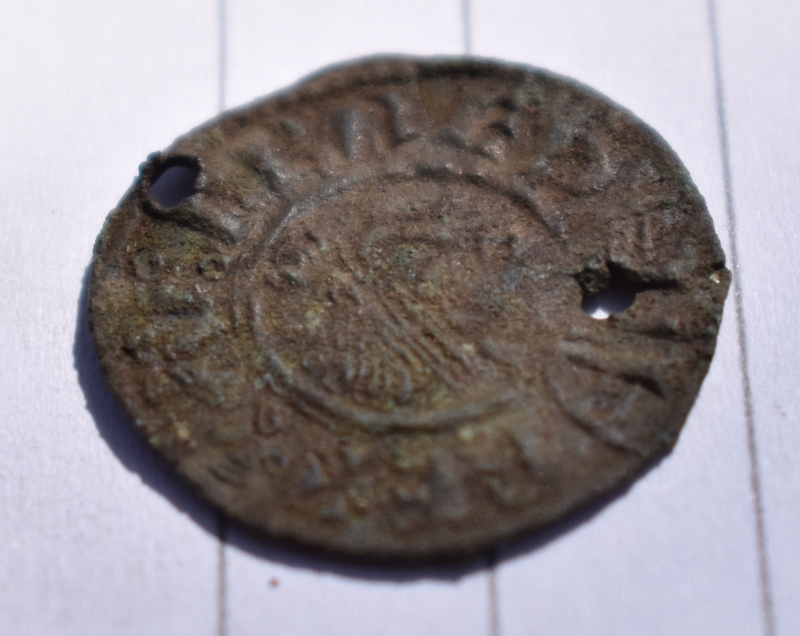 The team also unearthed 250 bullae, clay tokens impressed with seals that would be attached to legal and commercial documents as proof identity and authenticity. The seals were found in the late Bronze Age layer and date to the Hittite Empire in the 13th century B.C. when Karkemish was the seat of the Hittite viceroy who controlled the entire region. Among the 250 bullae are the seals of some of the highest ranking individuals in the Hittite administration of the city, most notably that of Taya or Tahe, prince and “charioteer of the goddess Kubaba.” Researchers are excited by the great number of bullae recovered because they hope the seals will reveal new information about the people, trade and administrative systems of Karkemish during its most prosperous period. 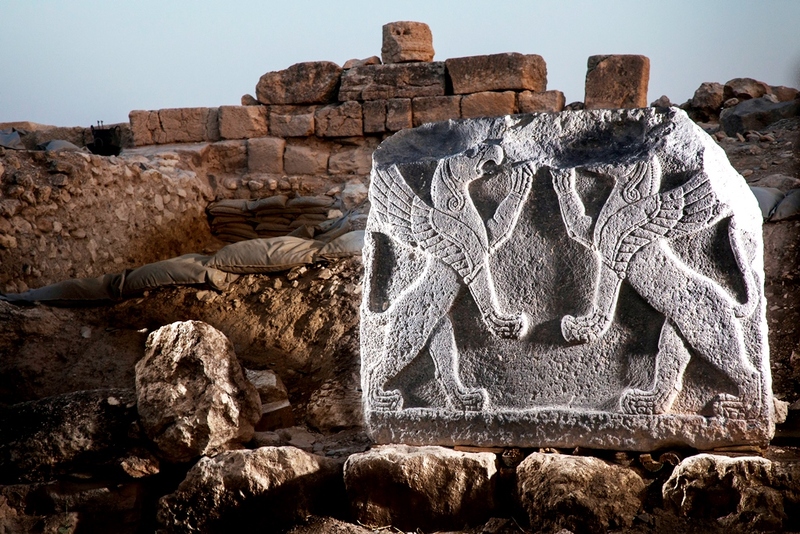 Another exceptional find made in the same area of the city is a large basalt relief of two rampant griffons. 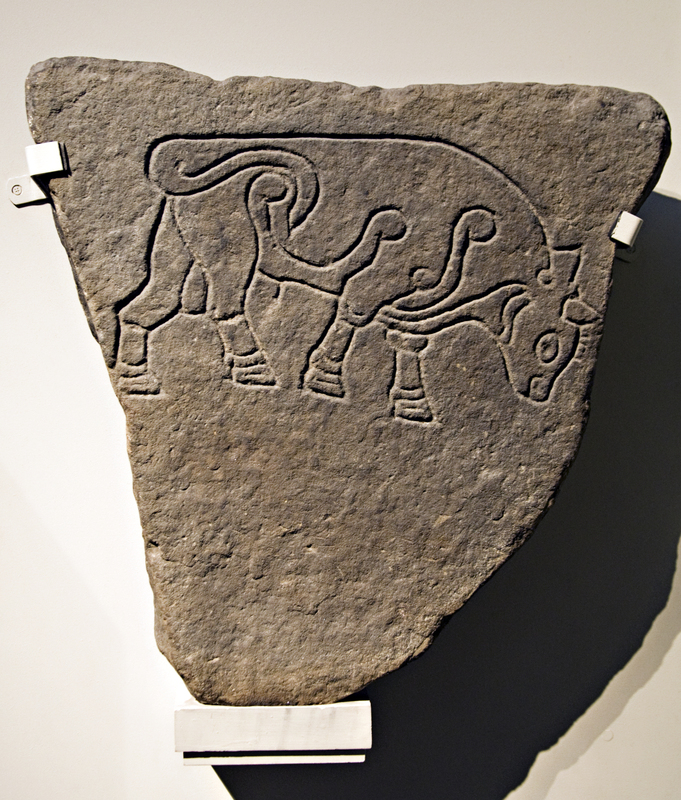 It was carved at the end of the 10th century B.C. during the reign of the Neo-Hittite king Katuwa who was better known for his construction and sculptural endeavors than his prowess on the battlefield. The griffon relief is believed to be one of a pair with a relief of a winged bull discovered during last year’s excavation. Archaeologists found significant architectural remains as well, including the remains of a massive fortress and a grain silo, both dating to the end of the Neo-Assyrian period, around 1100 B.C. 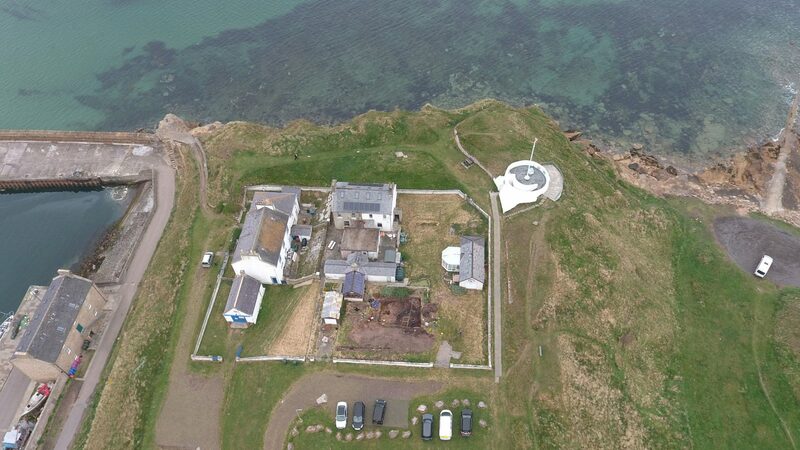 Seven season of digs will soon come to a culmination when the site is opened to the public for the first time next year. Karkemish is in a militarily sensitive area and access has long been restricted. The Turkish Minister of Culture and Tourism announced earlier this month that on May 12th, 2018, the site will open its doors as the Karkemish Ancient City Archaeological Park. 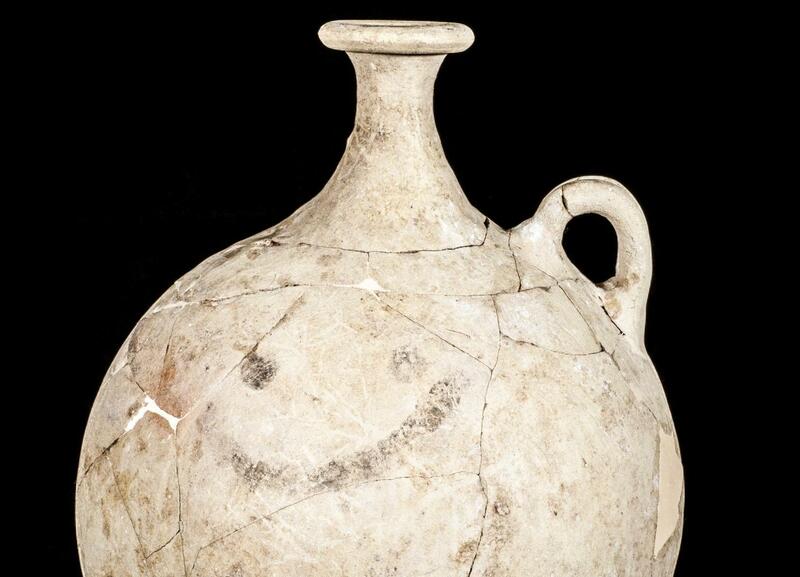 The smiley jug will go on display at the nearby Gaziantep Museum of Archaeology. 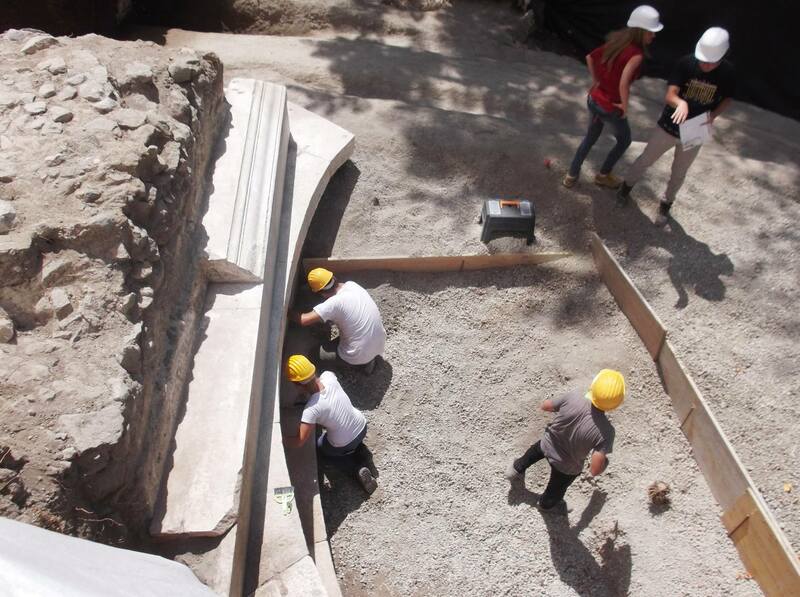 There is a whole new sense of urgency and meaning behind the excavations and the upcoming archaeological park. On the Syrian side of the border, the civil war has taken an unbearably onerous toll on its rich ancient history. While some of the most precious and beautiful archaeological remains in the world have been brutalized by ISIS and other belligerents in this quagmire from hell, excavation and conservation of ancient material culture has continued undeterred just over the border in Turkey.